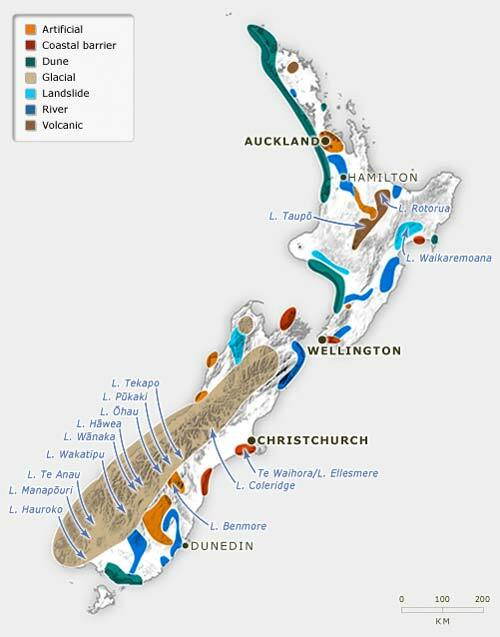 This map shows the distribution of the main types of lake in New Zealand. The variety of lake types is due to different geological processes. For example, glacial lakes have formed in parts of the South Island that were formerly covered by glaciers. Volcanic lakes occur in the central North Island, where there is a zone of intense volcanic activity. Source: D. J. Lowe and J. D. Green. ‘Lakes.’ In Landforms of New Zealand, 2nd ed., edited by J. M Soons and M. J. Selby, 108. Auckland: Longman Paul, 1992.